One day, Drona decided to hold a competition in which the Kauravas and the Pandavas could display their skills. The princes' demonstrated their expertise in using weapons like bow and arrow, sword, spear, and mace. 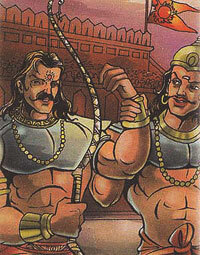 There was a fierce mace fight between Bhima and Duryodhana. Arjuna impressed everyone by shooting blindfolded, creating fire and rain with arrows. Pleased, Drona declared that no one could match Arjuna. At this, a young man named Karna came forward and repeated everything that Arjuna had done. He challanged Arjuna. Drona said that an ordinary man could not compete with a prince. Duryodhana who was jealous of Arjuna immediately declared Karna the king of Angadesha. But the fight could not take place as the sun had set. Karna was actually a son of Kunti, the mother of the Pandavas .